"I'll Take My Stand: American Art and the Great Depression", Daura Gallery, Lynchburg College, 2002, no exhibition catalogue. Cole, Sylvan, Jr. Raphael Soyer: Fifty Years of Printmaking, 1917-1967. New York: Da Capo Press, 1967, no. 36. Gettings, Frank. 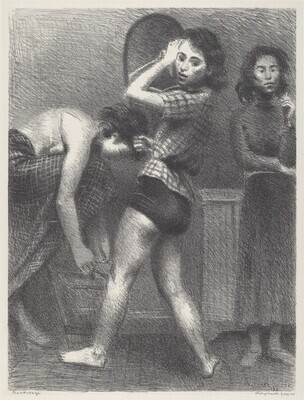 Raphael Soyer: Sixty-Five Years of Printmaking. Washington, DC: Smithsonian Institution Press, 1982, pp. 32-33, no. 27.